1919 BALDWIN - The 1919 Baldwin 4-6-2 "Pacific" type locomotive, Santa Fe #3415 was moved to it’s present location at the Abilene & Smoky Valley Railroad yard in April, 1996, from the city park in Abilene where it had spent the last 40 years. Locomotive 3415 was built in 1919 and was in regular service on Santa Fe's Argentine District out of Kansas City. The railroad donated the locomotive to the city of Abilene in 1954 and it was placed in the city park. In 1996 the city donated it to the Abilene & Smoky Valley Railroad. It was moved from the park and placed on the railroad’s tracks near the depot where it sat on display until restoration was started in 2005. This is the only operating steam locomotive in the State of Kansas and is one of only three operational, former Santa Fe steam locomotives. 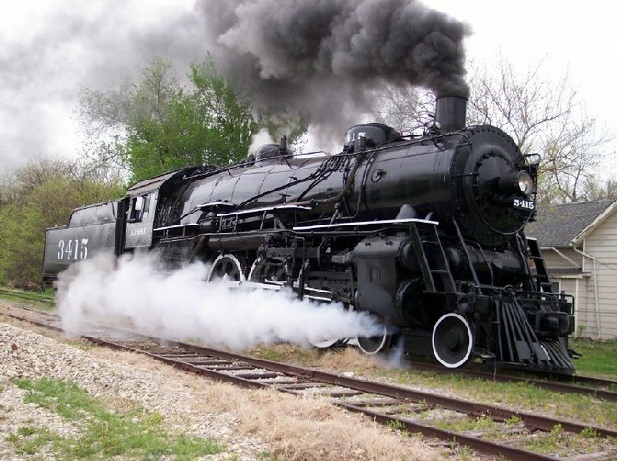 Plans are that the steamer will operate about once a month on special weekends on our five mile long track, a former Rock Island Railroad branch, through the Smoky Hill River valley between Abilene and Enterprise, Kansas. 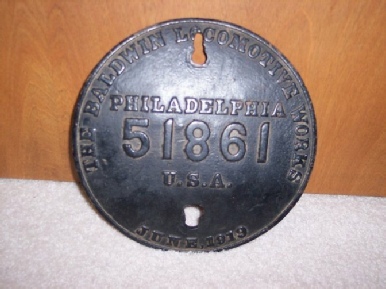 This is the original Builders Plate for the 1919 Baldwin Steam Engine showing that it was completed June, 1919. Locomotive #3415 was placed on the National Historical Register in April, 2012.